Musings of a Menopausal Melon - mmm! quilts: It's Real and I'm Not Dreaming! I was listening for that motor sound all morning and into the afternoon, hoping the truck would arrive before I had to leave for the airport...yes I was supposed to be headed to Nashville to meet Dayna, flying in from Detroit, to go wedding dress shopping. In the end, I am not headed up there this weekend due to a horrific snowstorm through the Detroit area that has shut down flights Friday/Saturday. Nor did I hear the telltale sounds of that motor. Oh but I did hear the thump at the front door, and I knew. How did they know me so very well? I actually gasped aloud and may have said, "Oh!" when I pulled this first fabric bundle out, said fabric bundle which would have shown off Bella's blue eyes so well... I had to open it up, spread them out and pet them as they so deserved. Water. Nature. My favourite colour, and with purple--! Shiver! So perfect! We got batting!! I have used Hobbs Batting a few times, most recently in my Mum's quilt, Forever Flowers, this very batting, 80/20, and I just loved it, and she even commented about the lightness but warmth at the same time. We got another package of batting too! This is new to me, not that it's 100% polyester batting, because I've used their Tuscany and it's to DIE for. I got my first Tuscany as a remnant at Alma Sue's Quilt Shop, leftover from the Amish ladies who love this batting for hand quilting. I machine-quilted two quilts now with it and it is wonderful. I'm anxious to try this Thermore out and let you know my findings! It goes perfect with my rain-resistant coat I was taking to Nashville! Like how did they know?! I can't show you what's in there, but DROOL and exclaim and oh-my-gosh galore. You will see. Patience, grasshoppers. All in good time. This said 'the sea' to me. Rayon?!! I want to make a blouse, a tank top, flowing, cool, like right now. Bye. Okay it'll keep. I did not know they could batik rayon but like duh, it's a natural fibre so okay! I put a piece of coral I found during a pre-sunrise beach walk last year here, and two hand-painted stones by a local artist who walks that beach each day and purposely tosses them in front of beachcombers to find. Don't you love that? On the flip side of her little paintings she writes an inspirational word and her initials. The seaweed-looking shell is one I found, painted, or rather, etched by Mother Nature. I hope I will inspire some of you with what I do with this luscious piece. Gulp. 3 yards?!! I think sand, yes? On top is a pack of 5" strips. I want to bite one; they look good enough to eat. NO!! Yessss!! But seriously! Like five spools AND a massive cone?! Prior to this cone I'd only been the proud owner of one cone of Aurifil. Now I have two, 2600 and now 2024.😍 And 6 more spools to add to my growing collection. Thank you Aurifil! A beautiful package of 2.5 strips with coordinating yardage. this lickable 😋 pack of fat quarters which I'll be digging into this weekend to assuage my disappointment at no Nashville. I have a great little project to whip up and show you on February 13, Galentine's Day! I am so glad that I got to photograph these beautiful, rich colours on a hot humid day here in southwest Florida, a perfect backdrop to them. My mind is whirling with possibilities. Maybe I will be turning them into some of my designs drawn for the 30 Quilt Designs Challenge! Talk about inspiration on Instagram! We are feeding off each other and encouraging each other and I am so happy to be a part of such a talented group! Again, I am so happy that I am not dreaming and this has really happened. Stay tuned for some upcoming creativity! Quick note that that pink in the last photo reminds me of the Postcard from Sweden quilt along happening here beginning Feb. 14. Notice I've made us a page under the Quilt Alongs tab at the top of my blog. It's not too late to snag a kit from Mad About Patchwork if you are in Canada, especially, because Katy is offering my readers free shipping on any order over $50 with the code MMMQAL, one per customer. If you are a US resident you can snag a kit from Stitch Stash Diva. Tayva is also offering free shipping within the US! I know I know, I'm living up to my 'The Enabler' new nickname! Oh my just seeing all those fabulous fabrics has my mind swirling as I know your's is. Happy quilting my friend!! Glad you are enjoying the goodness this year also! what a wonderful package to receive - makes up for loosing out on the trip to shop for wedding dresses? It's been really fun to see the reveals from the IB peeps I follow. You have some really fun fabrics! Can't wait to see what you create with that yummy bright pink! Wasn't it fun to receive all of these goodies from Island Batik! I can't wait to see what you create this year! Such a wonderful package to receive! Can't wait to see what fun things you make! Well, if that goody box doesn't say Florida, I don't know what does!! It is just so you! Fabulous!! (I have one of those scarves and love to pet the fringe. I know, weird. But I think you understand.) I am looking forward to all the luscious things you make with this. And how neat that they thought of Bella, too, by providing that box. The thing that grabbed me most, though? 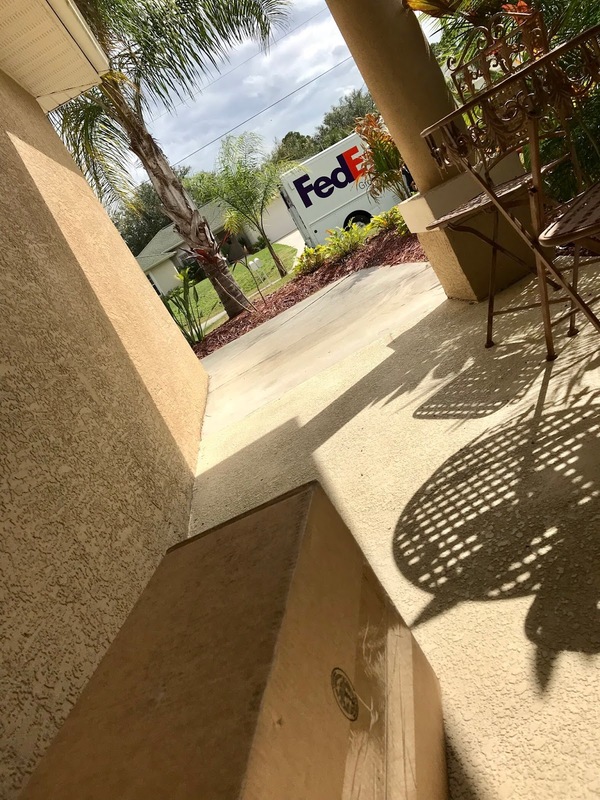 How in the world did Sandra get that photo of the box on the porch along with the FedEx truck before it got away?? (I do hope you get to go wedding dress shopping soon. It just keeps snowing and snowing. My husband has cabin fever and irritation that there's no where else to put the snow when he clears the driveway. I told him he had to take up quilting. Then the weather would faze him at all. Who is a very lucky girl, then??? Your happy post made my day! I can't think of a nicer person to receive so many goodies in the mail all at once. And I *know* you'll make fabulous things and share them all with us! Such fabric goodness! I can't wait to see what you turn them into. Oh, it was just like Christmas! So much variety of quilty goodness! I use the Hobbs wadding too and love it, saying that I think I prefer warm and natural especially as there is a lot less lint, but that has risen is price so much in the UK I stopped buying it. I was stunned by your Aurifil purchase, I have a few but mainly in neutrals, I need several colours for my latest quilt but it issuing to be too expensive so I will need to change brand, sad. I love seeing all the differences! I already have some ideas cooking up - we’ll see how it goes! The scarf was worn to church this morning....so much fun. After tea, starting on my first project!!!! Oh my! What a delicious box of goodness. Have fun playing with it all. Gorgeous! You almost make me miss Florida. We lived just north of Orlando for 14 years. They sent you bits of Florida and Canada. Looking forward to your new quilts and patterns. Not surprised by the 22 pounds! To die for Sandra. All of it is to die for. Maybe when I retire I can get in on this goodness. :) . Well miss enabler my fabric is on the way and of course I've talked my two closes quilting buddies into do this quilt along with me. There fabric is on the way as well. Let the cutting begin! I forgot to mention Sandra that all those hippy sundresses that people wear on the beach are rayon batiks.